Homemade Ricotta Gnocchi | This Girl’s Gotta Eat! This past weekend we hosted an Italian themed dinner party with friends and I was excited to make homemade gnocchi for the first time. I called in the big guns to help teach me….my Italian mother-in-law! Since this recipe is so easy and is equal parts, you can make whatever quantity you want! Just remember these are dumplings, so a little goes a long way! Sprinkle some flour on your counter. In a large bowl, combine equal parts of flour and ricotta (start with 1 cup of each) with a wooden spoon or spatula. When it starts to mostly clump, transfer mixture onto your floured counter. Using your hands, continue to mix until well incorporated and a dough has formed. Add more flour to your hands and/or to the counter if the dough sticks to your hands. Cut off a 3-inch chunk and set the rest aside. Dust your counter and hands with flour, then using both hands roll the small chunk into a long tube or rope, until it’s about a 1/2-inch thick. Using a knife, cut small dumplings about a 1/2-inch in size. Repeat these steps until you’ve used all your dough. Dust the small dumplings you cut with a little more flour. Then using the back of a 4-pronged dinner fork, roll the dumplings with your fingers, pressing along the prongs to achieve a ridged effect. You can skip this step if you’d like, but the indents will make it visually appear more like gnocchi, and will help whatever sauce you use stick to the pasta. 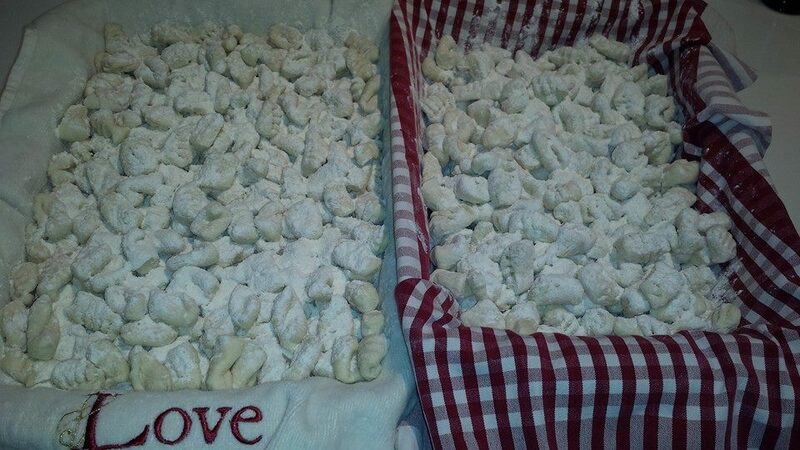 At this point you can either cook the gnocchi or freeze to use later. If freezing, lay them on a baking sheet with a towel, dust with a little flour and cover tightly with plastic wrap. Transfer to your freezer and partly freeze them. You can then easily transfer them without sticking to a plastic zip lock bag or sealed container to store in the freezer until you want to cook them. If you’d like to cook them immediately, bring a large pot of salted water to a boil. Drop gnocchi, a handful or so at a time (be sure not to overcrowd your pot), and cook for 2-3 minutes until they float to the top. Remove with a slotted spoon and toss with a sauce of your choice. I’ve made these with a simple marinara, and my mother-in-law has served them simply tossed with melted butter and parmesan cheese – both delicious choices! A meat sauce, pesto or alfredo would also be lovely options.